We’ve talked plenty about the potential power humor can have on marketing – as well as its potential pitfalls. If you’ve noticed, however, that some marketing these days is blurring the line between humor and absurdity, you’re not alone. The goal with oddvertising, as you might imagine, is to drive and generate buzz for a brand among audiences who may be more reflexively skeptical to what some would consider “traditional” marketing efforts. That fever-dream of a 30-second spot will serve its purpose in getting people’s attention in the moment, to be sure, but its real value comes in the brand engagement it can drive online after the fact – shares, retweets, likes, comments, “WTF?s,” etc. That’s where oddvertising can cut through the clutter and connect with consumers who may not be easy to connect with. Of course, the potential risks we discussed with the use of humor are exponentially greater with this type of approach. For example: The common thread among the oddvertising brands listed above? Their audience – millenials and younger. That’s an audience much more predisposed to this type of approach compared with others. And that’s why – as we’ve said more than once – crystal-clear understanding of your audience is crucial at all times. This isn’t to say this type of approach can’t work with other audiences, of course; it’s only to say that it’s important to know how your audience thinks and consider the degree of absurdity you’re conveying – and the manner and platform in which you deploy it. You wouldn’t want people thinking you’re weird, after all. So! Pokemon Go. If you’re not one of this runaway hit game’s increasing number of players, you’ve more than likely seen others playing it out in the wild. The augmented reality (AR) game has literally taken the world over since its release just a few weeks ago. While it may be just the next in a long and constantly evolving line of “hot” apps that take the world by storm, there are some unique characteristics of Pokemon Go that can offer some important lessons. What helps make Pokemon Go so popular? And are they things companies can take advantage of? Simplification. The best games, the old saying goes, should be simple to learn, but difficult to master. The concept of Go is pretty simple – “Gotta catch ‘em all!” – but actually catching them all is very rare. This keeps players engaged in the game more frequently and at greater length. Gamification. Using AR technology, Go uses your phone to turn the real world into a video game, making the experience immersive – and competitive. By putting players in direct competition with those around them and in their community, it also drives stronger ongoing engagement. Physical integration. This isn’t an app or game you play sitting at your computer, or in your living room, or in the car. It forces you out into the real world, exploring – and interacting with – various locations throughout your community. And this is where the real opportunity is for retailers in particular: what can you do to draw Go users to your locations? What incentives can you provide? Social integration. This refers to your actual social network, for once. It’s not uncommon to see groups of friends, co-workers and even families out exploring and playing Go together. This makes the game much more of a shared experience than your traditional app or video game – and it creates a unique opportunity for certain companies/retailers. Again, how can you capture groups of people and lure them to your retail locations? Pokemon Go is that rare mobile phenomenon that actually makes people more, you know, mobile. It’s also not your traditional app or social network, meaning it can be easy for companies to overlook. It’s important to remember, however, that opportunities to engage with customers and community are everywhere – gotta catch ‘em all! Much is discussed about the importance of brands identifying and engaging with key influencers – the prominent customers and other leaders that stand tall in their respective industries – and turning them into social advocates on behalf of its products and services. And for good reason – their support lends an authenticity to your marketing that is hard to produce otherwise. We so often cast our gaze outward when identifying these influencers, however, that we sometimes forget the most powerful ones may be right in front of us. Creating brand ambassadors and advocates out of our own employees offers significant upside for brands. After all, as this column recently reminded us, employees are a company’s most valuable and important asset. Beyond that, however, they are often regarded as its most trusted influencers. Know the rules. Establish an official social media policy for anyone and everyone who may represent the brand in any capacity via social media, and make sure everyone clearly understands it. Know the story. It stands to reason that employee advocates should clearly know your brand’s voice and personality to ensure consistency of voice across all communications and touchpoints. Know the game plan. Educate employee advocates on your marketing strategy – especially the role social plays in it – so they have objectives and goals in mind when developing content and engaging with audiences. Are supported. Creating and/or curating high-quality content that reflects positively on your brand ensures employees are armed with the resources necessary to be consistent, compelling and sustainable in their activity. The thought of ceding control to employee advocates can understandably make some marketers nervous. Done carefully and with proper planning and preparation, however, turning employees into social story-tellers can be a powerful, long-term marketing tool. Company apologies are never easy. From mea culpas to individual, disgruntled customers to worldwide “whoopsies!” for major blunders or scandals (hello, VW and BP! ), the company apology is a treacherous road for brands to navigate. Done poorly, they can cause companies to come off as callous and indifferent – or, even worse, open them up to excessive liability and legal action. Done right, however, they can also be an opportunity. We’ve been thinking about this more and more as the VW scandal in particular continues to expand. While that one is quickly reaching the level where no amount of apologizing will atone for the damage done, it’s the exception to the rule. For the vast majority of company miscues calling for an apology, an effective utilization of “our bad” can turn be a unique chance to humanize your brand – and, as a result, strengthen the connection your customers have with it. Be honest. This should seem obvious, no? And yet, many are the examples where a crisis can’t be contained because the company wasn’t fully and completely forthright in its scope from the outset. (VW is a glaring example of this unfolding in real-time.) Damage can be contained more effectively if information doesn’t continue to drip out slowly at irregular intervals. Be genuine. An apology should have just the right amount of emotional quality to it. It should be heartfelt and feel authentic. Be brief. Internally, make sure you know everything about the issue at hand. Externally, be direct and to the point. You can be honest and transparent while only sharing the most relevant details of an issue. Be positive. The best kind of apology puts the transgression in perspective while pivoting toward the positive features and benefits of a particular product or service. The path to a proper company apology is full of potential potholes, to be sure. Handled thoughtfully and thoroughly, however, a company can make sure it’s not sorry it said sorry. 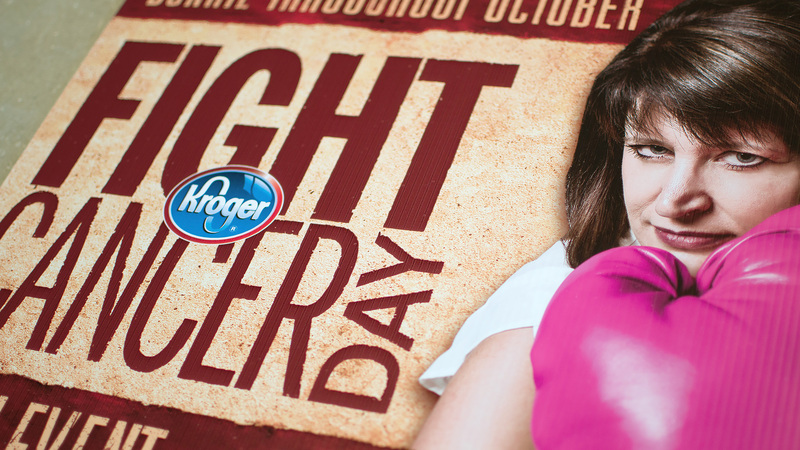 Once again this year, the community-minded folks at Kroger devote the month of October to raising money to help the fight against cancer. And once again this year, they turned to us to help them take the fight public – and raise as much money as possible. 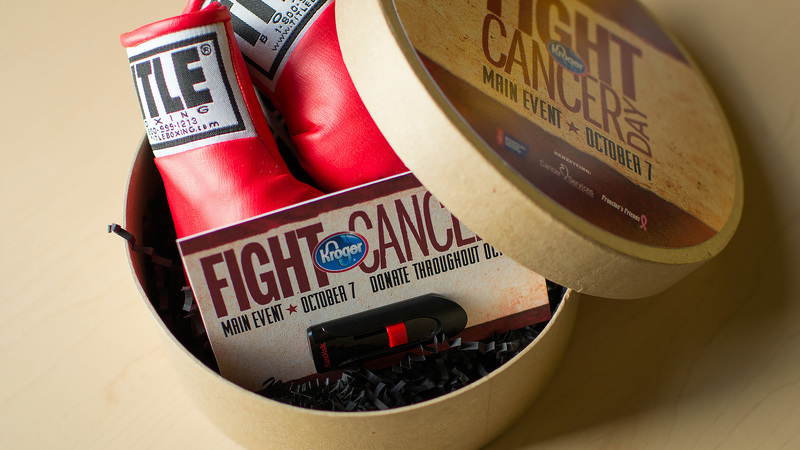 Through its annual Fight Cancer Day promotion, Kroger stores in the Fort Wayne area donate a percentage of their sales from an entire day in October to three organizations leading the fight against cancer – the American Cancer Society, Cancer Services of Northeast Indiana and Francine’s Friends. In addition, shoppers can make donations at check-out through the entire month of October. The more shoppers who know about these opportunities to help in the fight, the more money raised, of course. Which is where we come in. 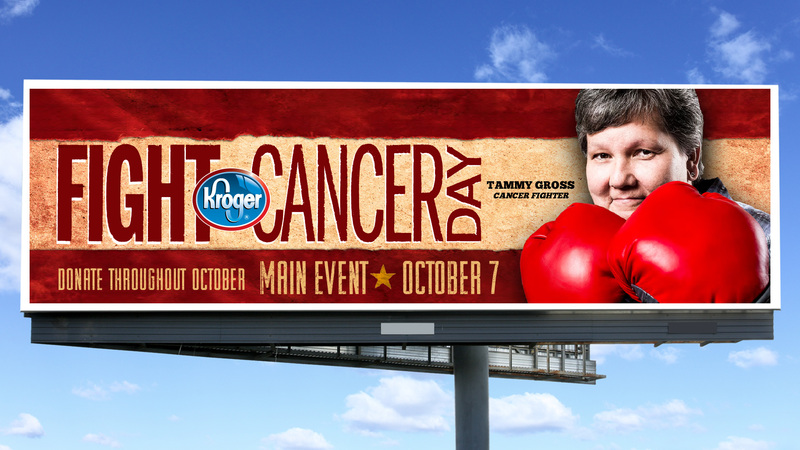 Working with the team at Kroger, we identified three store employees from the region who’ve fought cancer and won, connecting them with one of the supporting charities and then showcasing them in a high-profile, cross-platform campaign, including outdoor, print and in-store materials. While we don’t know the total amount raise for this year’s efforts, we’re confident our sharing of the inspiring stories of perseverance and bravery shown by these employees will make this year’s total one of the best ever. And, in the process, make the fight against cancer stronger than ever. As you may have heard, the Pontiff is in town this week! Pope Francis’s historic visit to our fair little country has dominated local and national media coverage almost nonstop. In our fractured media landscape, such instances of a singularly dominant news event are increasingly rare – and even more rarely are they for “positive” news. As such, the opportunity to connect themselves to such an event and position themselves brand in front of such a large and captive audience is obviously very enticing to a lot of brands. Just because you can do something, however, doesn’t necessarily mean you should. The rise of social media has fueled the increase of “real-time marketing” – the ability for brands to market in real-time based on popular and/or high-profile events. The big deal used to be – and still is, to some extent – who had the best Super Bowl commercial, for example; equally important nowadays is who has the best tweet based on actual events taking place during the game. It’s an exciting proposition. Again, with our media landscape as fractured and decentralized as it is, it’s a big deal to be able to take advantage of so many people in the same “place” at the same time. A perfectly timed tweet or Facebook post can positively position your product in front of a massive, rapt audience. For some brands – like Fiat – it’s easier to capitalize on the Pope’s visit than it is for others. Like anything, successful real-time marketing requires a healthy combination of circumstance, observation and, most importantly, discretion. The event – and the opportunity it presents – needs to be more than just big. For your product and your brand, it needs to be right. You may have heard the news this week that Facebook is getting ready to unveil a “dislike” button. While the majority of users gave the news a big thumbs up – people have been clamoring for a dislike button on Facebook for almost as long as Facebook has been around – brands were less enthused. Now they have to worry about a deluge of dislikes? Should they dislike the dislike button? First and foremost: The dislike button isn’t really a dislike button. As Facebook CEO Mark Zuckerberg explained in announcing the feature, it’s more of an empathy/sympathy button. There are experiences/news/events people share on FB – the death of a loved one, loss of a job, injured child, etc. – where users want to commiserate, but the like button doesn’t seem appropriate. Now, users can share a frowny-face emoji or click a thumbs-down button, for example, for a “sad” post. The ultimate goal, from Facebook’s perspective, is to give users more opportunities to interact with each other in more ways. Its goal is not to make it easier for users to trash or disparage brands – it’s those brands advertising on the site, after all, that keep FB in business. Does this mean brands shouldn’t be prepared for the button – should it come to full fruition – to be used in ways other than FB intends? Of course not. Conversely, does it mean brand pages will be overrun with dislikes on each post? Most likely not. Remember: If someone wants to voice their displeasure with your brand, it’s already very easy for them to do so. They can leave a negative comment on any post. They can create a negative post on your page. They can publish a negative post on their own profile. They can like someone else’s negative comment or post. They’ve always had the means; this new feature – if it comes to be – would be just another way for them to voice criticism or complaint. On the other hand, it can also be a way for brands to be more empathic, more personable, more human. It makes it easier to interact with their audience on a personal level, in turn strengthening their connection on an emotional level. So is the dislike button adversarial Armageddon for brands? Almost certainly not. Is it something brands should be aware of and prepare for? It wouldn’t hurt. Can it be another opportunity to connect with your core audience in a meaningful way? Absolutely. And that, ultimately, deserves a big thumbs-up. But indulge us for the next few minutes, if you would, while we proudly pat ourselves on the back. After all, big events like this don’t come around very often. Rich thought long and hard about returning to New York and Madison Avenue. The more he thought about it, however, the more he realized going on his own here, in Fort Wayne, was the best step forward for him. And so it was that in the summer of 1975, Ferguson Advertising came to be. And so it is that, 40 years later, we’re still here – and better than ever. Many things about our industry and how we work has changed, of course; technology has left virtually no part of what we do untouched in the scale of its impact. Indeed, there are things we do – digital and social come to mind – that didn’t even exist when we started. More important to our success, we believe, is what hasn’t changed – our continuity of ownership, our commitment to clients, our strategic smarts, our creative focus. Those attributes are what make us the Ferg – and that’s why they haven’t changed. And why they won’t change over the next 40 years. Okay, self-promotion is officially over. (For now.) Back to work we go. Kleiner Perkins Caufield & Byers is one of Silicon Valley’s most legendary and prestigious venture capital firms, having helped give rise to some of the largest and most famous companies in the world, including Google, Twitter, Amazon, Spotify and Uber. So when leaders at KPCB talk about the future of the Internet, people tend to listen. Ecommerce keeps moving to mobile. Our on-demand culture is meeting head-on with our increasingly mobile culture, meaning brands have to get increasingly sophisticated in order to make their mobile shopping experience as simple as possible. The death of email (again). Proclaiming email overwhelming, too cumbersome and, as a result, on its deathbed is nothing new, of course. It’s just that there’s more and more evidence this is the case – take the explosion of internal communications and collaboration apps like Slack. Users generating content in droves. The explosion in smartphones makes it easier for people to create content on the go and share with their networks. The challenge – a perpetual one – for brands is to monitor, capture and share high-quality content, which gets more and more difficult as the number of content-sharing platforms continues to grow. Speaking of content, a picture is worth a thousand words. When it comes to writing, millennials are all like, “whatever.” It’s no coincidence that the explosion of visually driven social networks – Vine, Snapchat, Instagram – has come as millennials came online en masse over the past several years. So it’s important for brands – especially ones with younger audiences – to understand that content isn’t just the written word anymore. Indeed, it’s often anything but. You can view the full report here – as always, it’s a deep dive and very educated guess into what the future holds, especially for marketers. Do you know your peeps? For marketers, positive word of mouth + social media = BOOM GOES THE DYNAMITE. This equation should come as a surprise to just about no one these days, especially to those who work in marketing and brand management. Most marketers get the social media part of that equation, too, as we continue to better understand and appreciate its power as a platform for communication and engagement. Where we still often find challenges, however, is on the “word of mouth” side, especially when it comes to identifying who the most important mouths belong to. Any positive word of mouth is a net positive for brands, of course, but not all word-of-mouth is created equal. Where it can really pack a punch, and where it can scale through the reach of social media, is when it’s coming from not only your biggest fans but your most influential ones as well. Simply put, making a positive impression on influential people can make an exponentially positive impression on your brand – and your bottom line. While there’s some overlap between these two, more important are the areas where they complement and strengthen one another. As the studies referenced above indicate – and as many studies before them have done as well – there’s nothing quite so powerful and potent for marketers as a growing, organic wave of positive perception via word of mouth. Knowing the potential power of word of mouth backed by social media, the question becomes, do you know who your brand’s influencers and advocates are? If so, how do you engage them? And if not, how do you start finding out?